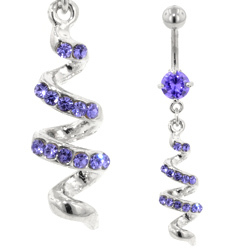 Glamorous and eye-catching, our waterfall belly bars are the perfect way to make a statement. 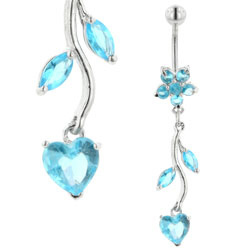 These belly bars all feature waterfall style jewels and charms that hang from the bottom of the belly bar. They come in a huge choice of designs, from cute hearts and colourful jewels to chic silver and pearl drops. Like all our body jewellery, these belly bars are made from high quality materials that will not irritate your piercings. Most of our waterfall belly bars are made from surgical steel, a lightweight, biocompatible metal that feels very comfortable to wear. Below are just a few of my favourite waterfall belly bars but be sure to check out the full range at BodyJewelleryShop.com. For pure glamour, you can’t beat one of our jewelled waterfall belly bars. These bars feature sparkling jewels that shimmer and shine against your skin. They show off your piercing and draw attention to your curves, perfect for glam summer style. We have hundreds of beautiful designs to choose from, but here are three of my favourites. For simple elegance, take a look at our range of silver waterfall belly bars. These stylish designs feature sterling silver charms and clear jewels. The polished silver has a wonderful shine that catches the light and adds effortless chic to any outfit. 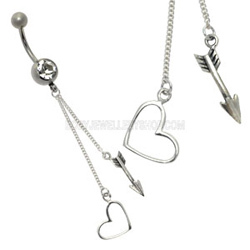 This entry was posted in Navel Bananabells and tagged Belly Bar, Belly Bar Jewellery, Belly Bars, Belly Button Bar, Belly Button Bars, Cute Belly Bars on May 21, 2014 by Piercing Guru.